Blade is straight, double edged and of flattened hexagonal section. A deep fuller runs for two thirds of the blade's length. The tip of the blade is slightly bent. The grip is of slightly rounded quadrilateral section, and barrels slightly towards the middle, tapering down towards the metal ferrules at either end. The quillons are long and of slightly flattened, tubular section, being completely flattened in the middle section beneath the hand guard, and with button terminals. The pommel is round with a flat-topped tang button. 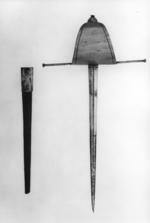 The hand guard is plain and triangluar, and fixed to the quillons with two blind rivets. The grip is bound with wire. The sheath is of black leather and is missing its chape. The mouth is of ferrous metal and has a belt loop.